Today we are entering Cambodia but first a 5am start to see the floating wholesale market in full swing. It was a wholesale market with each floating warehouse flying their wares from a long stick. Four hours by coach with plenty to watch as the road seems to be just one long village. Brick kilns using the red clay from the river. We are in the delta and it's FLAT. We boarded a fast boat - its got about 25 seats and is a bit like a bus. Hot inside the boat and in the sun on the aft deck. There are cold drinks and fruit on offer but the 5 hours are rather boring as the river has very little happening and the landscape around is very flat. We have a bit of excitement when we leave Vietnam , we have to get off the boat and go through the Vietnamese border post waiting about 15 minutes for our passports to be stamped. Then back into the boat for about 5 minutes then we approach the Cambodian border post which has a plank with a bamboo rail - very unsafe looking and we are only able to have one person on the plank at a time. once in Cambodia there start to be a few pagodas with golden roofs. People on the riverside are mostly fishing and wave. 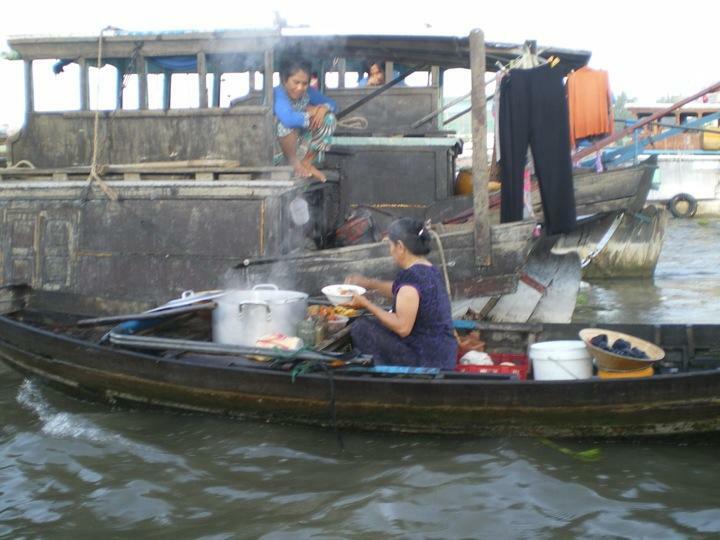 As we approached the city of Phnom Phen the engine cut out and we drifted as the boat crew struggled to get it going . Took only about 10minutes which was as well since there were a few much bigger boats around and we were drifting.